In most cases, you will not have to replace the lock on your door if the key got broken within it. Our locksmiths will follow the procedures for a broken key extraction and will be able to get the broken part of the key out of your lock in no time. Our locksmiths are trained to handle situations like this, and they have done so a countless number of times so make sure that if you happen to be in need of a broken key extraction you call us. If you do not give us a call, and you attempt to extract the key yourself, you run the risk of damaging the internal components of the lock mechanism, and this will most likely mean that you will have to replace your lock if it cannot be repaired. Yes! Any reputable locksmith is well versed in making spare keys, and our locksmith will be able to help you make a spare key/replacement key for the broken one in your door. You can copy a broken key if you know what you are doing. This can either be done with the pieces of the broken key, or the bitting code of the key. No! It is of the utmost importance that once you realize your key is broken off within your lock that you do not continue to attempt to unlock it. This could result in you pushing the broken key piece further into the lock mechanism, and this makes it much harder to take out. Once you have come to the conclusion that your key is broken off in your lock, you should focus on calling a professional locksmith who knows how to get the job done. Do not insert foreign objects into the lock in an attempt to try and get the pieces out. This might cause further damage to a situation that can be rectified with a simple solution. Having to start your day off with a broken key is one of the most infuriating and unfortunate incidents that any homeowner can go through. As unlikely as it may seem that your key will break off within your lock, it is a more common occurrence than homeowners would like to think. The exact moment when you realize that your door is not opened but instead you are holding one-half of your precious key can be hard to take in. As professional locksmiths, we understand this first hand because we have been through this experience many times, and we have also helped many homeowners through this same ordeal. Also, if you happen to break the key off within the lock while the door is still opened, then you will very likely be unable to lock the door to your home on your way out. This drastically decreases your home security until you are able to rectify these situations. There are some homeowners who will be willing to risk leaving their doors ajar because they feel as if they have other security measures in place. However, it is better to always be safe and make sure that your home security is working efficiently. Sometimes this involves calling a locksmith to take care of a broken key extraction. In the event that your key breaks off and there is a part of it that is hanging outside of the lock, then you might be in luck. When a key breaks off in a lock, it might either be hanging out partially or it might be broken off completely in the lock. If it happens to be hanging out of the lock, then homeowners might even be able to grab the piece out by pinching it with their fingers. If there is only a sliver of the key hanging out of the lock, then homeowners should not use their fingers to attempt to remove it because they might end up pushing it further into the lock. They should instead make use of needle nose pliers to try and extract the broken piece of the lock. Please note that these options will only work if the key is protruding from the lock. If you do not have needle nose pliers on hand, then leave the door as is and call a professional locksmith to help you out. In the case that the key is broken off in the middle of the lock, or there is no part of it that is protruding, then a professional locksmith will help you take care of the problem. The first thing that needs to be done before a locksmith begins the broken key extraction process is lubricating the lock. This is important because, in most cases, either the lock or the key itself have suffered a lot of wear, tear, and external damage, so it is best to make sure that they are well lubricated. Our professional locksmith can make use of professional lock lubricant or other similar products to lubricate the lock before they being the broken key extraction. The locksmith will be making use of a broken key extraction tool, which they will insert into the keyway of the lock in a manner that allows the teeth of the broken key extraction tool to come into contact with the cuts along the key that is stuck inside. The locksmith will have an idea of just how far they are going to insert the extraction tool based on looking at the way the key was broken. A professional locksmith should be able to estimate how much of the key is stuck in the keyway of the lock. 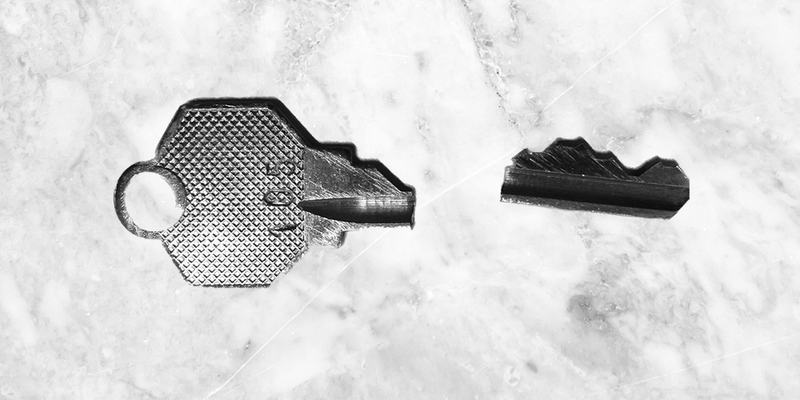 Once the teeth of the broken key extraction tool are caught on the bitting of the key stuck inside, the locksmith will begin to gently pull the key piece in their direction in order to remove it. This method obviously sounds easier than it actually is, so be patient with our locksmith if it takes a little bit of time. It is more important to do it right than to do it fast because this will prevent the lock from suffering any additional damage. he internal parts will grind together, and this friction will cause the lock to damage and deteriorate at a faster pace than usual. 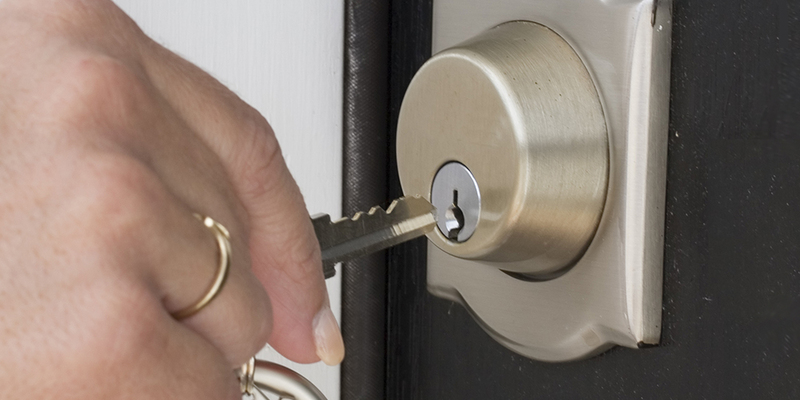 It is important that the locks in your home be lubricated at least once every 5 months. This will help them work more fluidly, and it will decrease the possibility of your key breaking off in your lock. Another way that homeowners can reduce the possibility of their keys breaking in their locks is to make sure that they have several spare keys on hand. Before you get confused, you will not be using the spare key to gain access to your home while there is still a broken key within the lock. That will not work. Having replacement keys on hand will prevent the key that you normally use from suffering excessive wear and tear. If you see any visible damage on your key (cracks etc. ), then make sure that you stop using it and switch to using a replacement key. This is not a foolproof method to stop keys from breaking in locks, but it is a really good preventative measure. Also, it is important that homeowners do not force their keys to turn if they feel it offering even the slightest resistance. A homeowner that uses their keys and their locks day in and day out will know just how the lock feels if there is something wrong with it. It is essential that they pick up on these small cues so that they prevent any long-lasting damage or any inconveniences from springing up. Many locks are damaged because homeowners continue to force the key to turn in the face of resistance. In most of these cases, not only is the key damaged and broken off within the lock, but the lock itself is damaged. This will put homeowners in the precarious situation of paying for both a broken key extraction and a lock repair or replacement.